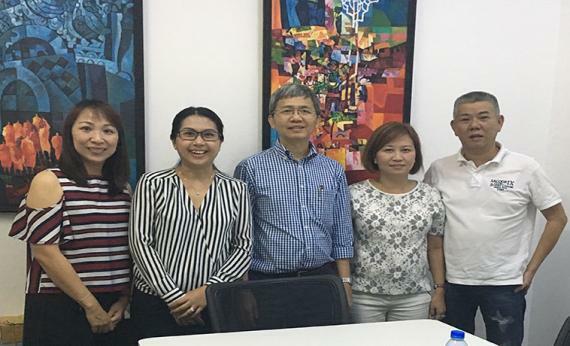 Universal Freight Organisation is delighted to report that KMS Logistics (UFO Singapore) visited Innovo Shipping and Logistics (UFO Myanmar) last week. Innovo and KMS have been working together on both inbound and outbound shipments between Myanmar and Singapore for the past few years. "It has been a great opportunity working together and supporting each other through the UFO network. We really value the support from KMS Logistics and it has been great we both met with our customers together in Yangon. Our strong partnership made us feel more confident! We really appreciate KMS team visit to Yangon and we hope to work more closely on more businesses together in future." "It was a great and fruitful trip in Yangon. We appreciated Mr Aung, Moe and his team very much for the hospitality and took care of us so well throughout the trip. We are indeed working very well with Innovo Shipping and we are very glad to have such a good partner in UFO. We are confident that we both will continue to grow together with our strong tie between Yangon and Singapore."